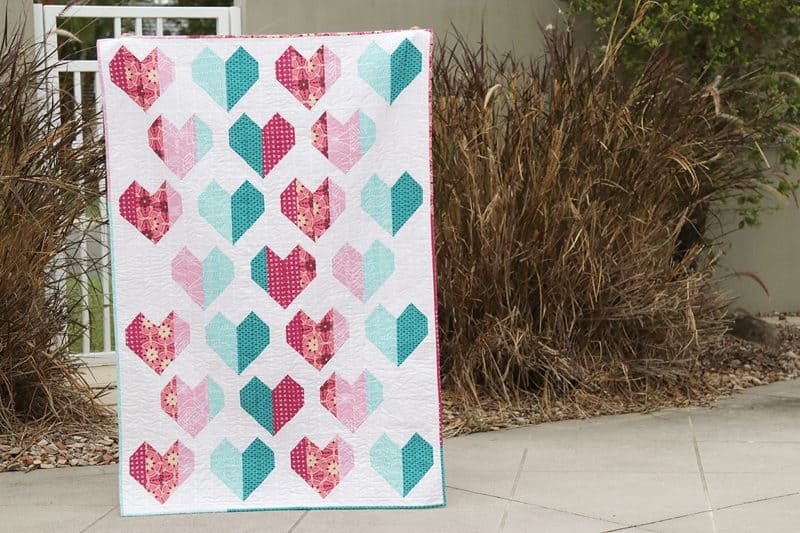 I have a fun Diamond quilt block tutorial for you today! 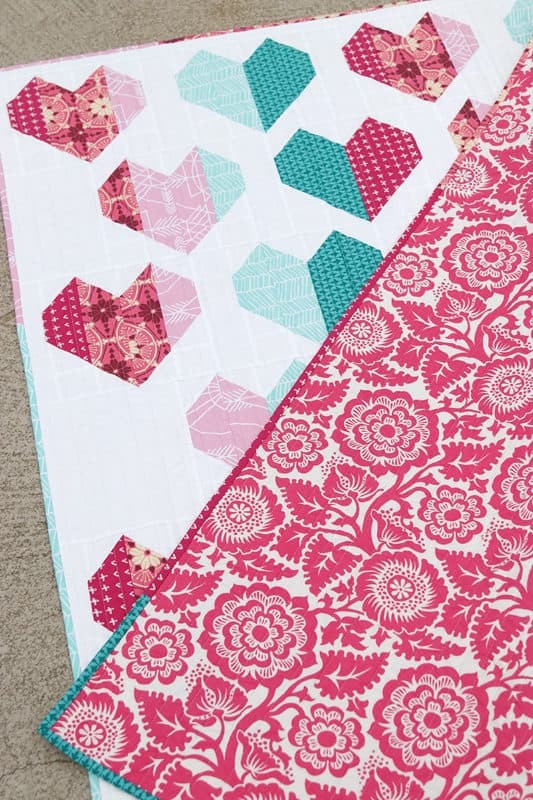 I’m actively working to reduce my scrap pile this year, which is how this diamond quilt block came to be. 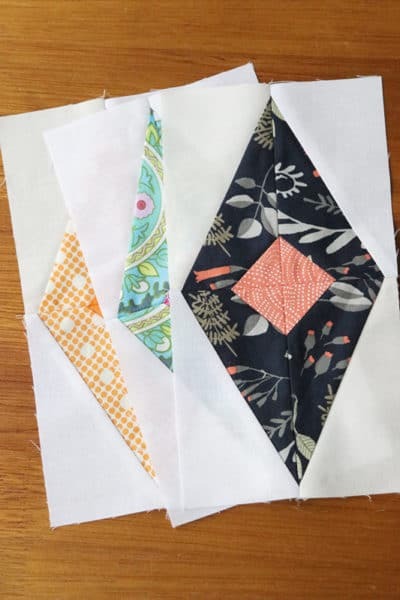 Because your backing needs to be 3-5″ larger than your quilt top (in each direction), you end up with a lot of long, skinny scraps. 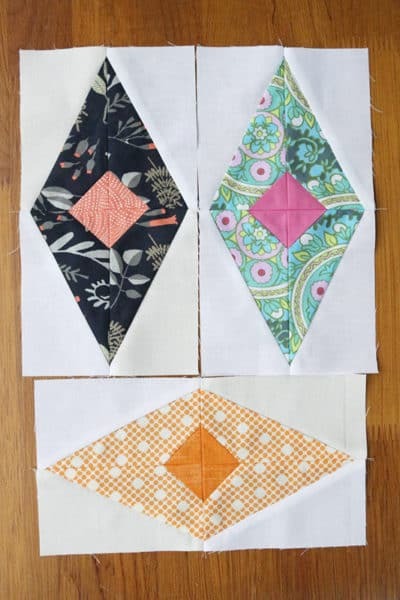 These are perfect for the rectangles needed to create the half rectangle triangles in this diamond block. This is what you need to make one block. 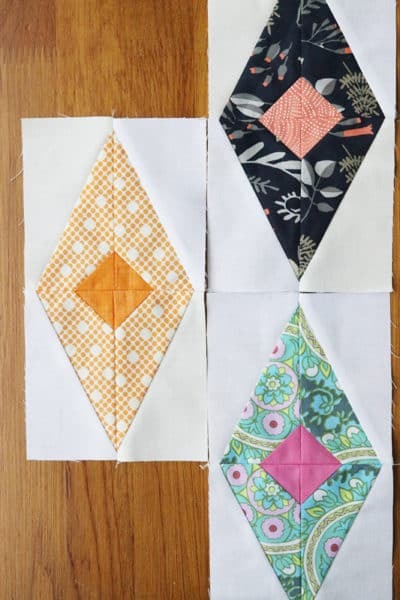 The blocks are 4.5″ x 8.5″ unfinished (4″ x 8″ once sewn into a quilt). Firstly, you need to cut the four rectangles diagonally – now pay attention here! 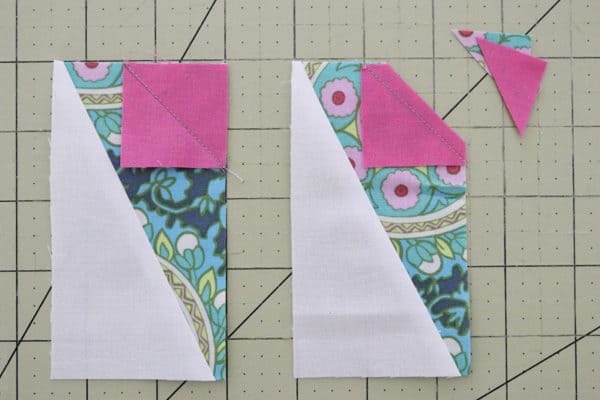 You need a top-left-to-bottom-right and a top-right-to-bottom-left cut in EACH fabric. 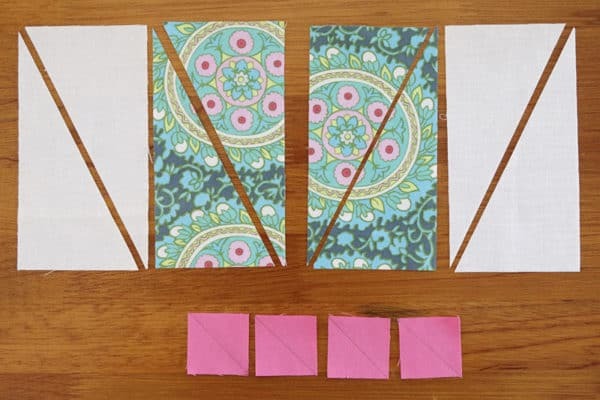 You also need to draw a diagonal line on the back of each of the 1.5″ squares. 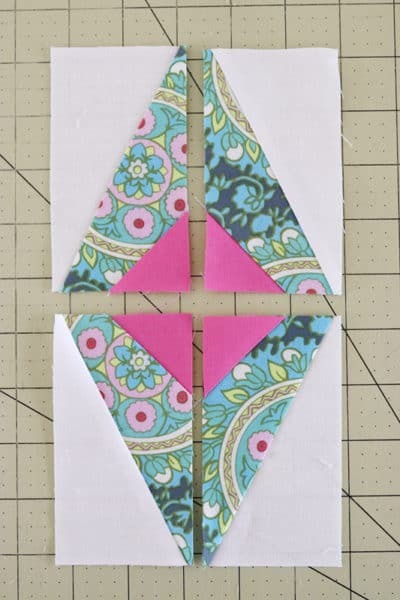 Take a set of triangles and place them right sides together along their long edges. You need to offset the triangles slightly. The triangles have two points – one more acute (skinnier) than the other. 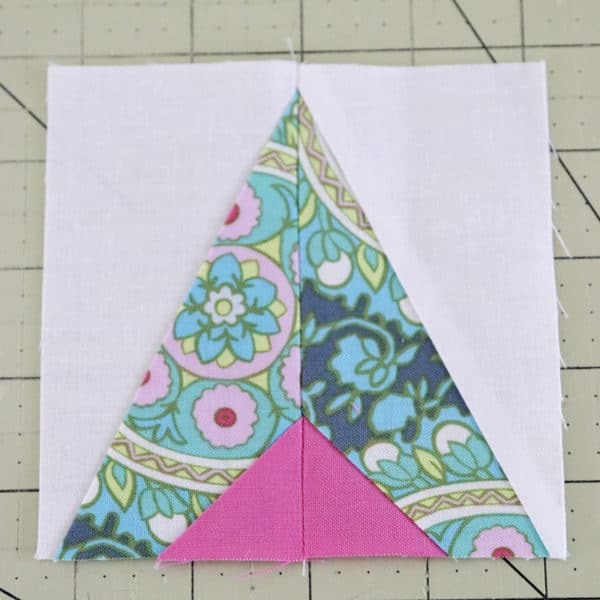 This skinny point needs to overhang the less skinny point of the other triangle by a quarter inch. Same for the triangles with diagonals in the other orientation. 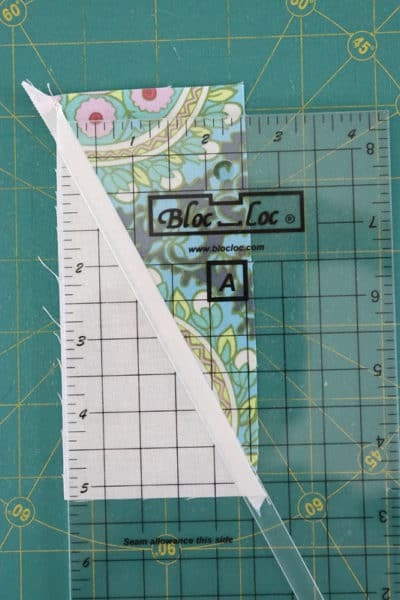 Buy some Bloc_Loc half rectangle triangle rulers! I’m not going to lie, they aren’t cheap but these babies will save you tons of time. I really love HRTs and make them often, so these have been a good investment for me. I bought the 8.5″ x 4.5″ HRT rulers* in the 2:1 aspect (the long edge is twice the small edge). They’re great because you can use them to trim any 2:1 HRT that size and smaller. 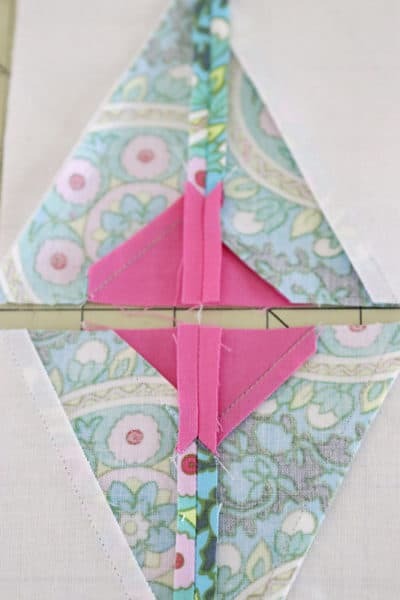 Next, take a quilting ruler and start at one of the corners with a diagonal. Line up one edge of the ruler with the long edge of the HRT. 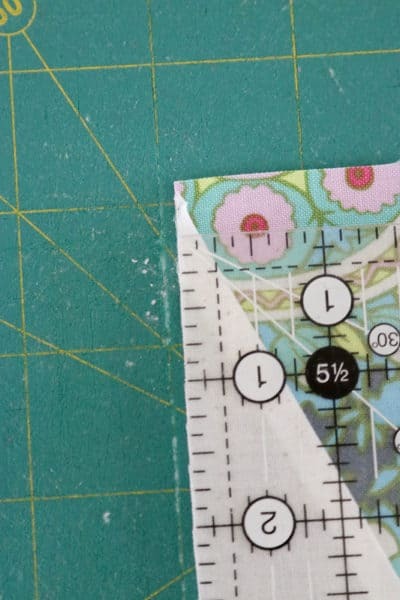 Then slowly slide the ruler down the unit (keeping the ruler/block edges lined up) until you find the spot where the diagonal is exactly a quarter inch from the long edge. Turn the HRT around and repeat the process with the other bisected corner. 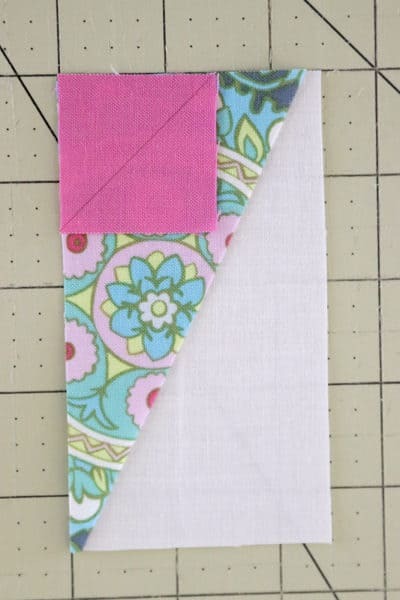 Before you trim the top off the opposite side, make sure your block is 4.5″ long when you have the diagonal matched up. Now you’ll have an HRT block that measures 2.5″ x 4.5″. Perfect. Press the seam in the same direction as the HRT seam (again, to facilitate nesting later). And when you’re standing at the ironing board and thinking, “what way did I need to press this again?”, it’s easy – just copy what’s already there! 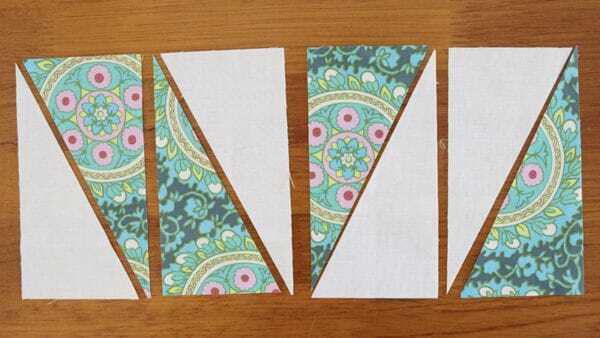 Sew the unit pairs together (I like to sew the long edges first). I press these seams open to reduce bulk. 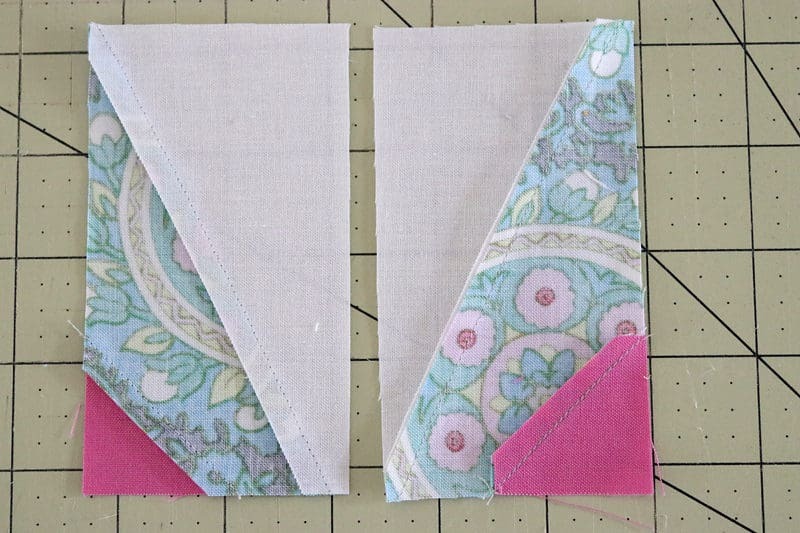 Then sew the two pairs to form a block. It will measure 4.5″ x 8.5″ unfinished. I like having the print as the main fabric with an accenting solid in the middle. 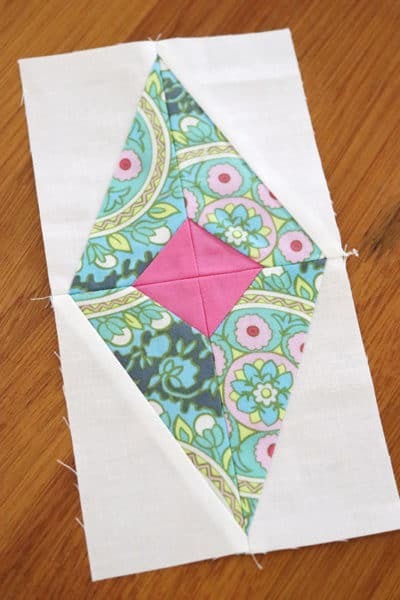 But you could reverse it and put the patterned fabric in the centre. 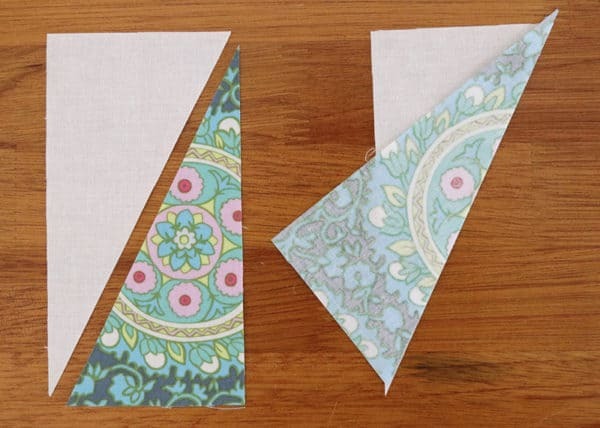 Or use two patterned fabrics – but be sure there’s enough contrast between the two so that the piecing is noticeable. Phew, that was a long post! Thanks for reading to the end and I hope you’re inspired to attack your scrap pile and make some diamond blocks. 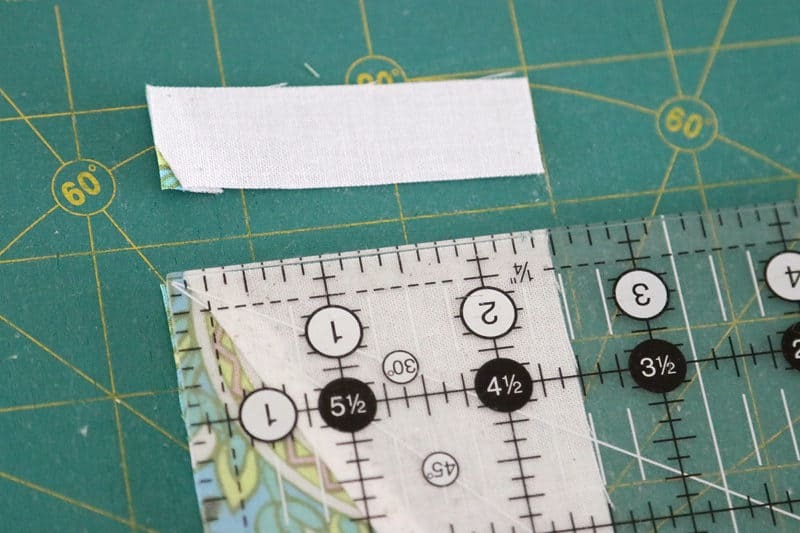 If you’re a fan of half rectangle triangles and want to experiment with other sizes, I have another post on sewing and trimming HRTs over here. Be sure to let me know if you sew some of your own (either email or tag me on Instagram or Facebook). Happy sewing and scrap busting. I recently sewed up another version of my Heartfelt Quilt – this time the crib size. 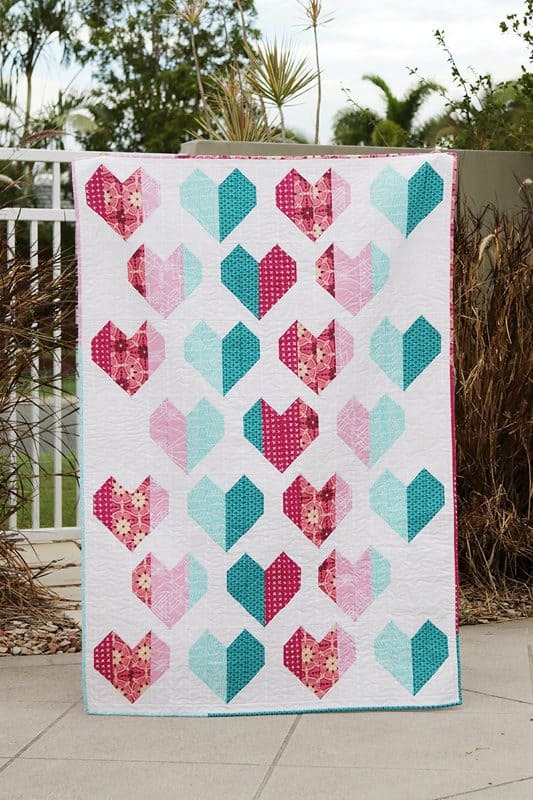 This heart quilt pattern is a lot of fun to plan and choose colours for. In an effort to make this part even easier, I updated the pattern to include colouring in sheets. These sheets can be printed out and coloured in to your heart’s content, auditioning all your colour ideas. 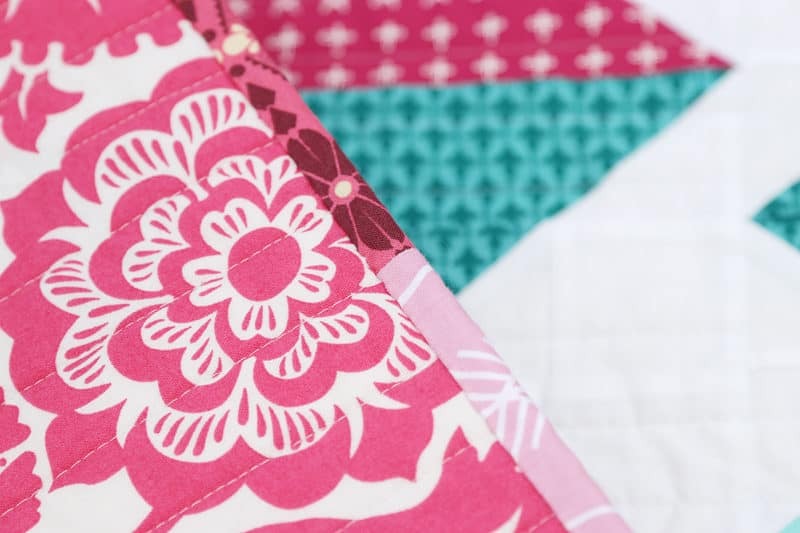 I knew this quilt was for a little girl and that pink was a feature colour for the nursery. I rifled through my stash and found I had quite a good selection of pinks. After playing with some gold and pink options, I settled on the pink and teal/aqua combo instead. To my eye it looks quite a modern colour combination. It was also very satisfying making the quilt entirely from stash (something I need to do more often, or so my cupboard tells me). 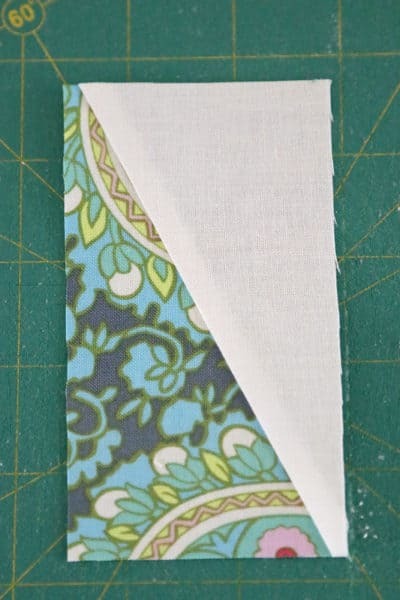 I was able to use the scraps left over from my half yards to form a scrappy binding for this one. 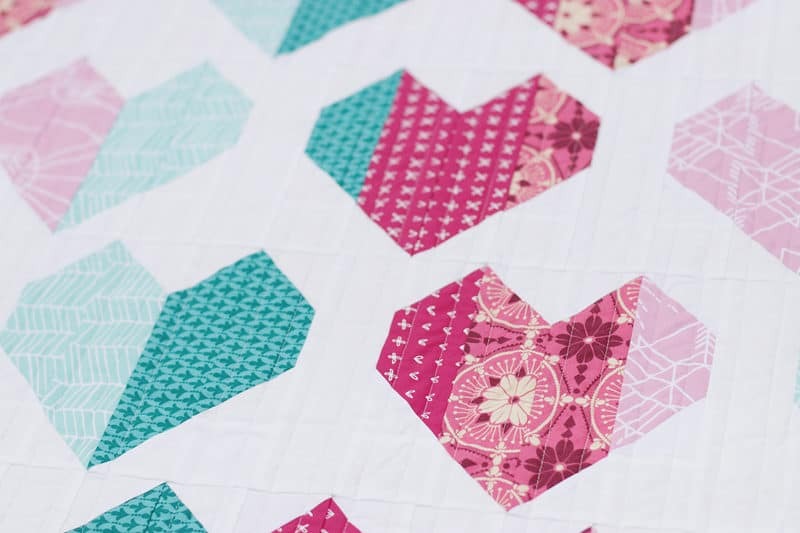 It was fun to sew up this heart quilt pattern with such bright, cheery colours. I do hope it’s new owner will enjoy it as much as I enjoyed making it. 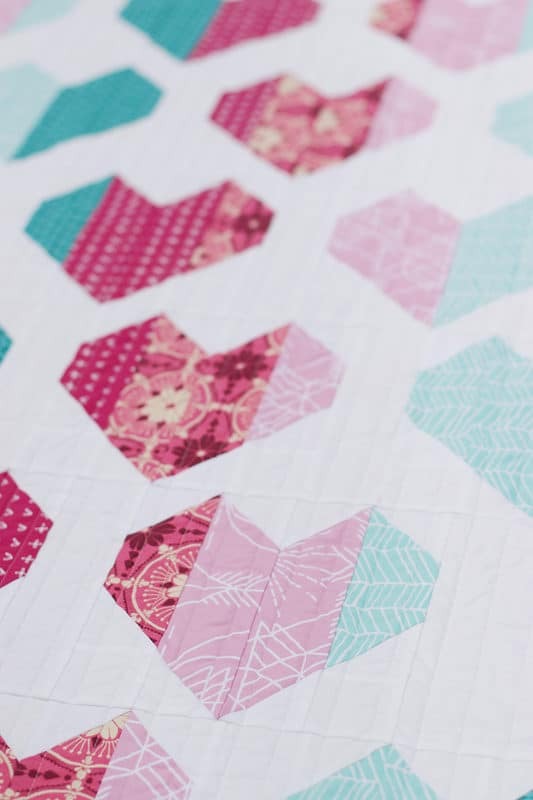 If you’d like to make your own Heartfelt quilt, you can find the pattern (now with colouring sheets) in my shop. 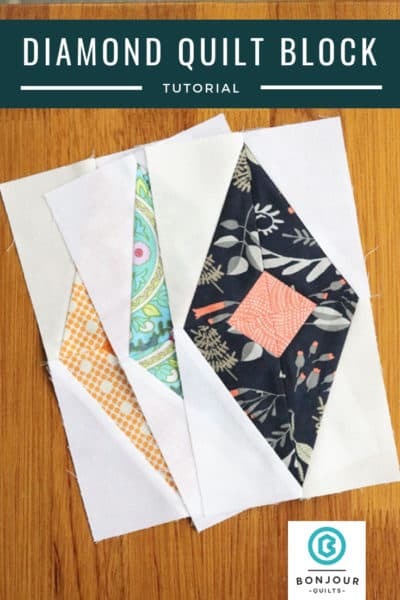 You can also read about the other Heartfelt quilt I sewed a few months ago in this blog post here. 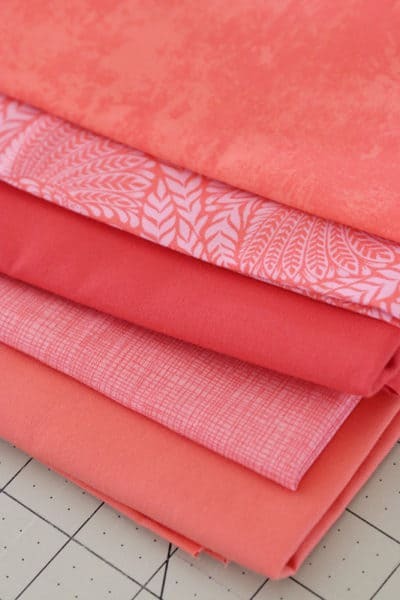 Coral fabric – do you love it? Or does it make you wince? I have to admit that after a rocky start the 2019 Pantone Colour of the Year, Living Coral, is growing on me. I’m not much of a pinky, peachy girl, but as an accent colour I can see that coral can be beautiful. 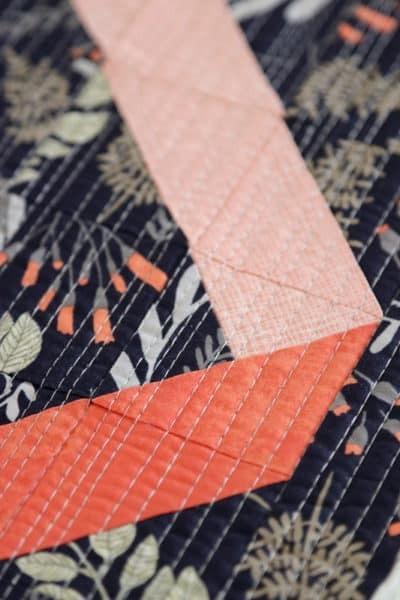 I’m especially fond of a navy and coral fabric combination. 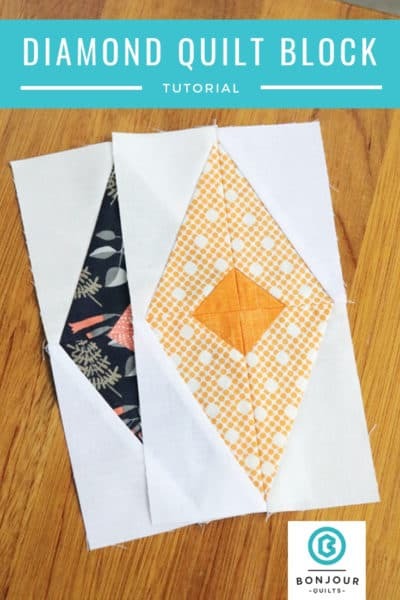 I’ve explored that with this pattern here, as well as with this mini quilt below (pattern here). 2. Deity in Orchid from Tula Pink’s Eden line (technically not coral as it’s an orange pattern on pink fabric, but it reads from a distance as coral. 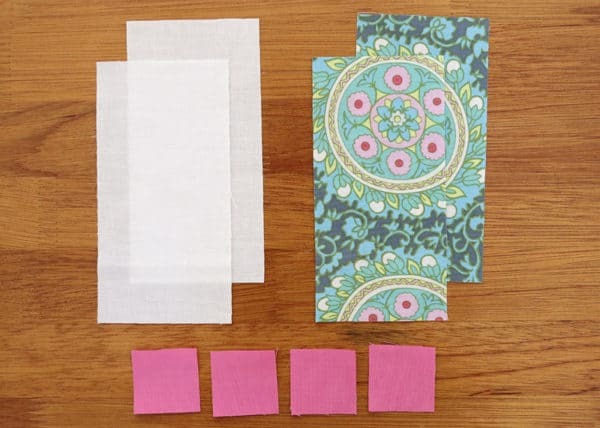 It’s also a very useful fabric if you are making a transition [or ombre] from orange to pink). 4. Not sure about this one. No selvedge. I think it’s a Timeless Treasures Sketch fabric. L to R: Fern Bouquet from Dear Stella’s Foxtail Forest, Carolyn Friedlander crosshatch in Creamsicle and Avantgarde Uninhibited in Bask. 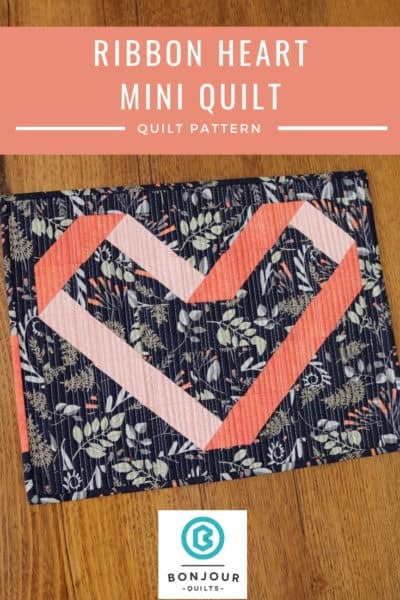 I thought this would be a fun combination to use with my new Ribbon Heart mini quilt pattern. 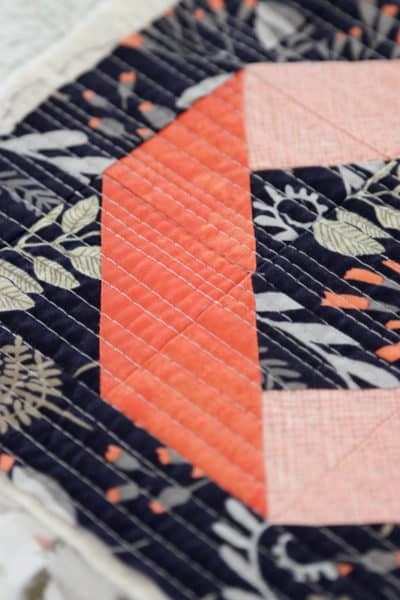 So far all my versions of this mini quilt had been made with darker fabrics on a pale background. I was interested to see how it would look with bright fabrics on a dark background. Hey, I think it looks pretty cute! 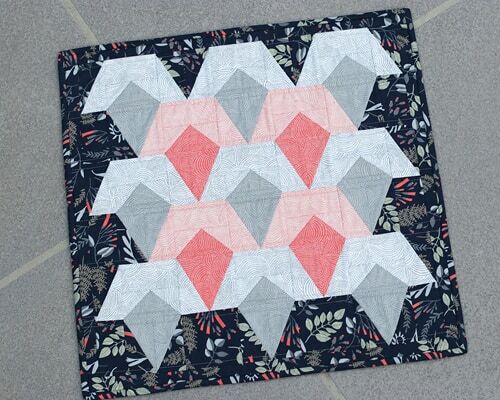 I had some fun matchstick quilting this one. Lots of lines in dove grey thread, but it really didn’t take long as it’s such a small piece. I didn’t want too much contrast in the binding for this one, as I felt it would detract from the pop of the heart. 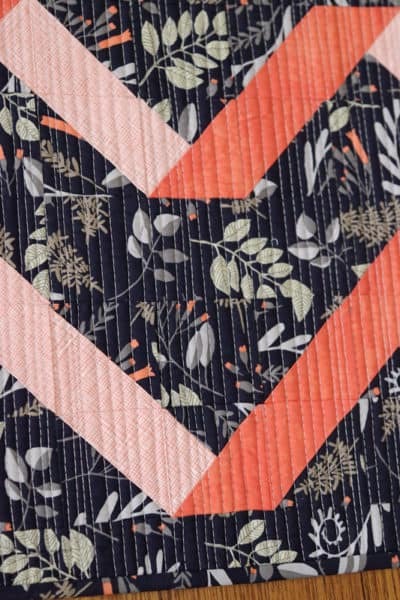 So I used the background fabric for binding with just a snippet of coral contrast (the pattern has instructions for this). 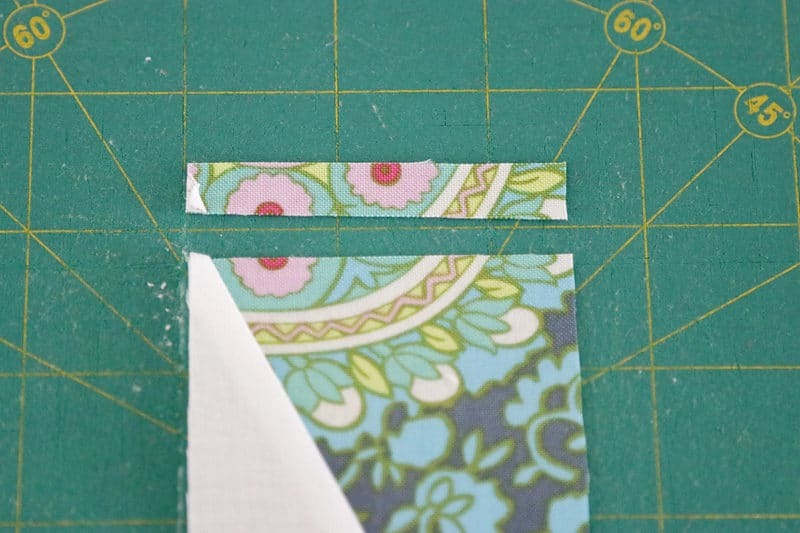 I could also have chosen to use the self-binding method, which I’ve described here, to create a “no-edge” look. But I don’t really enjoy sewing with that method very much. It’s somewhat finicky and by the time I’m at the stage of binding I’m totally over finicky! 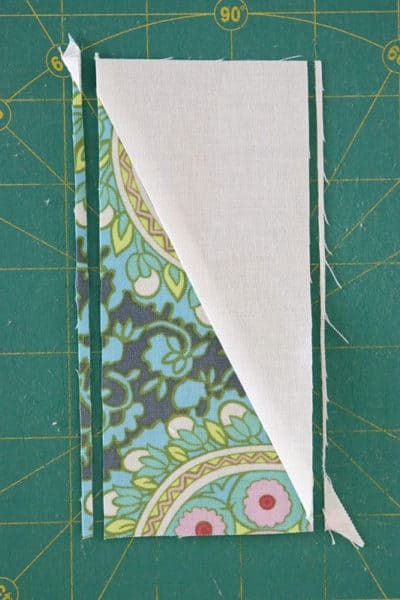 I much prefer to sew a standard binding, which is what I did. 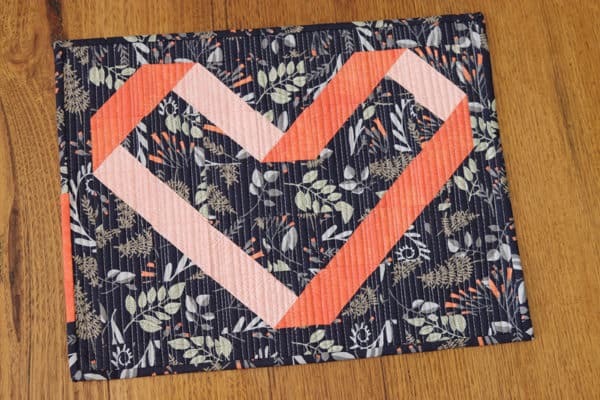 I’m really happy with how this Ribbon Heart mini turned out, and I enjoyed a bit of experimentation with coral fabrics. 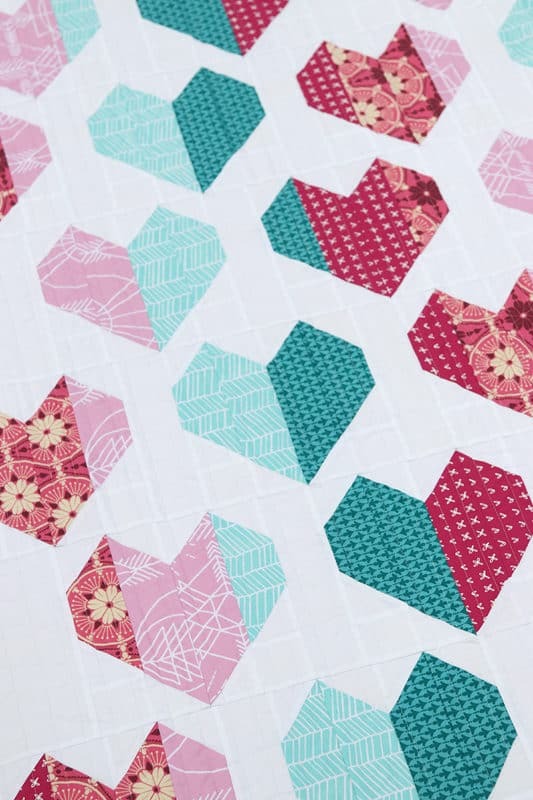 If you’d like to see the Ribbon Heart mini quilt made up in different colours, you can see some in this post here. 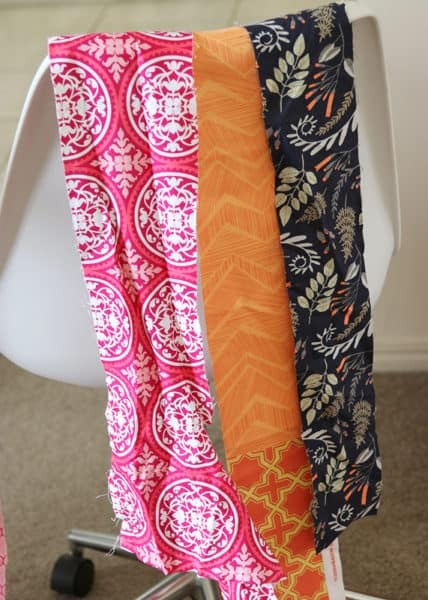 So what do you think about coral fabric? Yay or nay? Will you be sewing something in Living Coral this year?